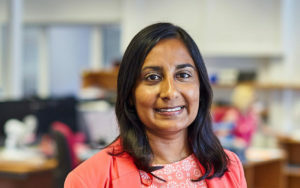 Meeta joined our firm in 2010 as a European patent attorney, having spent twelve years in industry, after training at another private practice firm. She has a degree in biochemistry from King’s College London. Meeta’s first in-house role was with a global agricultural biotechnology company, based in The Netherlands. Meeta then set up and led the IP department of a biotechnology start-up company in Belgium, which was subsequently acquired by a global chemical company. This experience of working within a start-up though its lifecycle has given her a unique insight into the needs and drivers of such companies. Meeta is always concerned with delivering support to her clients which is commercially and financially effective. Her technical experience extends across a range of technologies, including plant technology, vaccine compositions, natural product biotechnology, food technology, waste processing and biofuels. She has particularly in-depth experience in the fields of functional genomics, genome sequence applications, enabling technologies and the protection of technology platforms, and enjoys bringing the lessons learned in these technical areas to bear when working on new subject matter. Meeta’s experience extends across patent filing and prosecution, opinion work, due diligence matters, and contract drafting and review. Meeta’s previous work as in-house counsel, as well as her thoughtful approach to her work, enables her to provide imaginative support to start-up companies, research institutes, universities and multinational corporations. She is always keen to help find creative solutions for protecting IP assets. Meeta spends part of her working week based in Cardiff and is always happy to meet with clients or contacts there.